This weekend a nearby guild had a big stash sale. One of their founders, Marcie Lane, lost her fight with cancer last year, and they were selling her stash to raise funds for cancer care and research. Personally, I really like the idea of continuity in a stash sale. The room was packed, and every person there went home with a little of Marcie's legacy. I sincerely hope that when I am gone (you know, 40 or 50 years from now), my guild will sell off all my fabrics too. When I lived in the States, I thought my obsession with red and white quilts was because I'm from Canada. But, here was a whole room full of Canadian quilters who had no problem walking right by this bag. So obviously, it's just me. 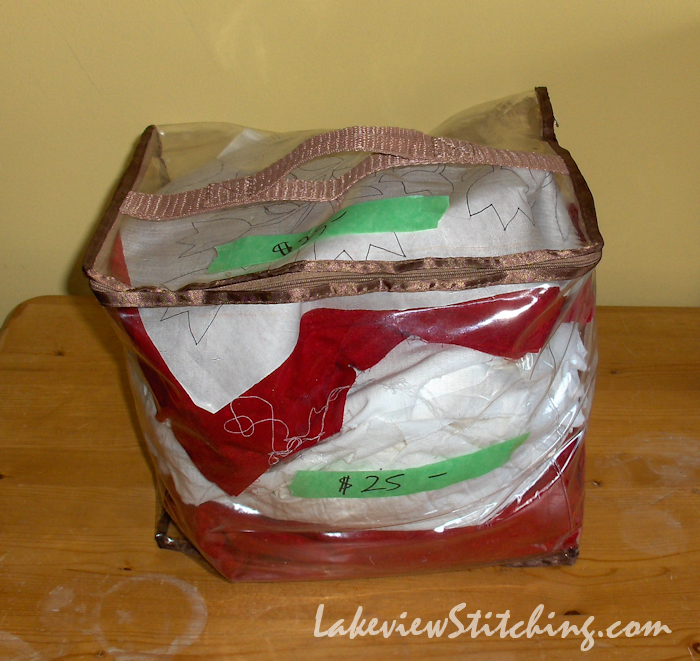 Looking closer, I could see there were several applique patterns on freezer paper ironed onto the red fabric. 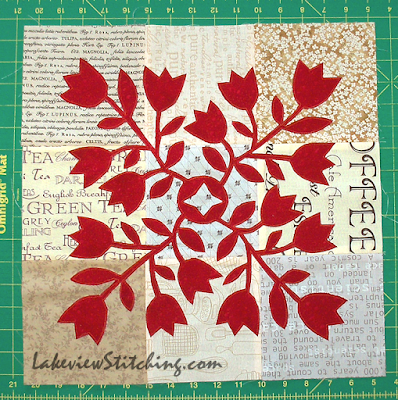 A red and white applique quilt, I thought. Nice! I added it to my pile, and sat down to wait for the checkout line to get shorter. I had a nice chat with Marcie's mom, who was also a Bob Ross fan. But the line didn't get any shorter, and I decided that I wasn't going to be able to wait. I put it all back and headed home. And all that white fabric probably wasn't part of the project at all. There were 11 blocks in the package, so I think Marcie had already started one, and that ended up separated from the rest. It is funny that I assumed that Marcie was making it the way that I would want to make it, even though that was not the case at all! 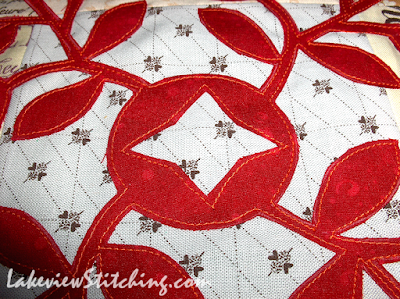 The fabric is a thick, rich red hand dye, so fortunately there is no wrong side, and the fabric is very stable. My fusible, however, was old and not sticking very well, but I kept the mat underneath at all times, and I got there. 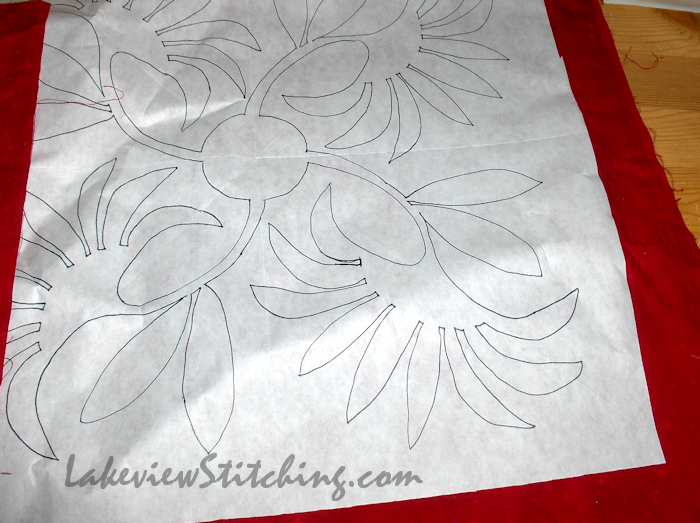 I laid it out again on my fabric, and fused it. 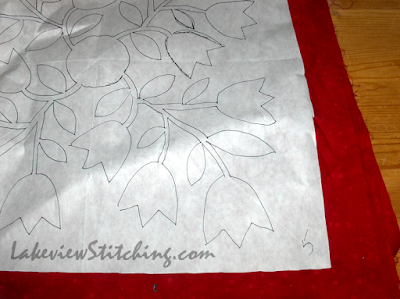 My plan was to straight stitch the edge, rather than satin stitch or blanket stitch. Over at Indigo Threads, Sharon recently shared a photo of a quilt she'd made this way. 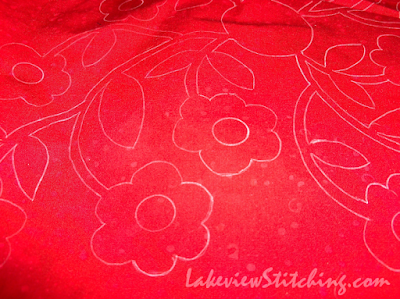 The fabric frays a little at the edge after washing, and I really like the soft look it has. I considered a matching red thread for the stitching, but then I decided orange would have more character. 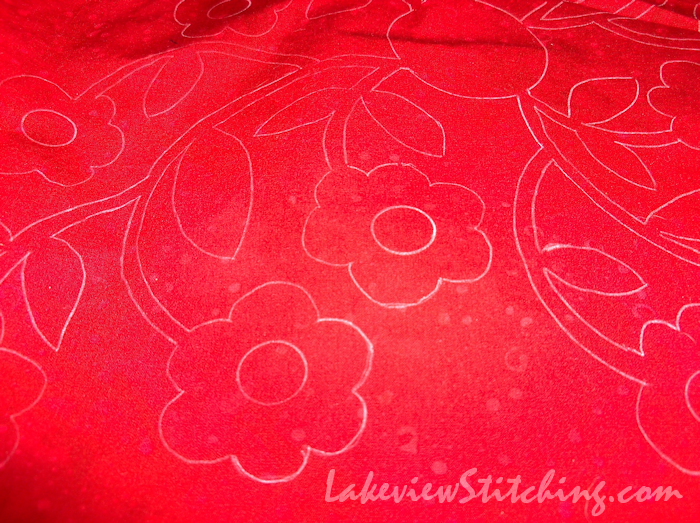 The stitch length is fairly short, about 1.75 on my machine, and I usually piece at 2. The red is so rich that it looks like velvet against the prints. I'm happy! I think I'll make 9 all together, and set them on point with alternate pieced blocks. It's all planned! 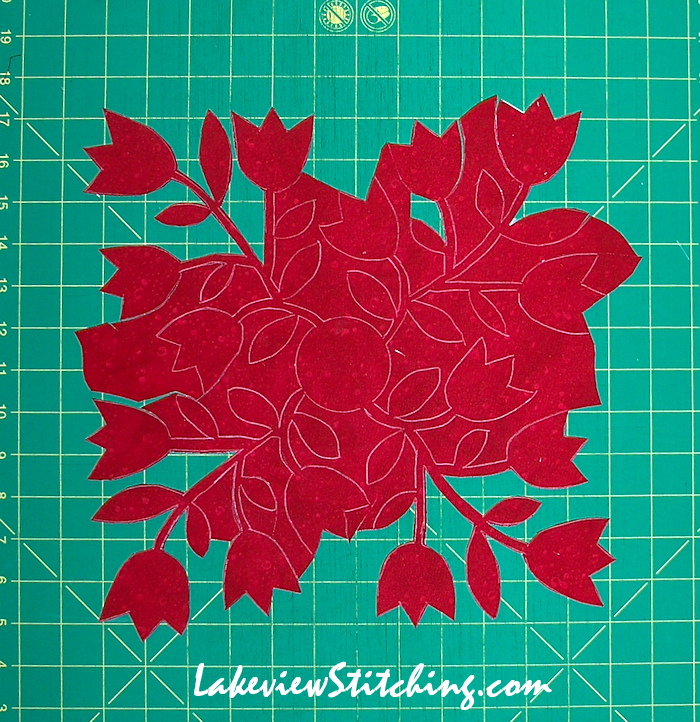 Since fusible applique is probably my future, I am glad this came together so well, and that I have eight more blocks to practice with. It was just the right degree of challenging, and I am interested to see how the next ones will turn out. Now I have to find room for it in my project drawers... Just when I had it all neat and organized, a new project comes along! is a good idea, as you say there is continuity and your purchase was a wonderful buy! 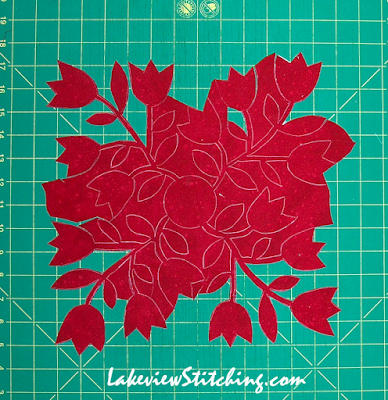 Your block is beautiful and what a quilt you'll have when all blocks are ready to go. Oh no, to be clear, I never met Marcie. Her guild opened the sale to all the guilds in the area. She worked in a quilt shop, so her stash was gigantic! They will need a couple of trucks to move mine. I like what you did with that red. 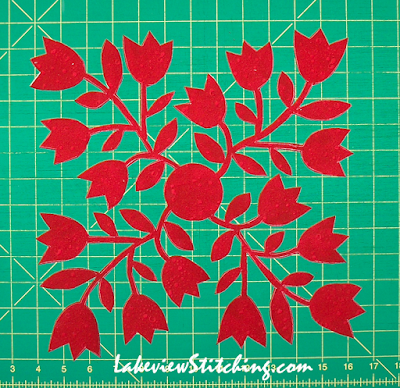 I have been doing some fused applique and like to see how others do it. It's a good story. It illustrates how ideas work and the power of adopt and adapt. It will look great and be so rich in association. Perhaps the Guild could hold another fund raiser next year, exhibiting all the things made from Marcie Lane's stash! LOL, that is a good idea. Thanks, Jillian! What a great story. 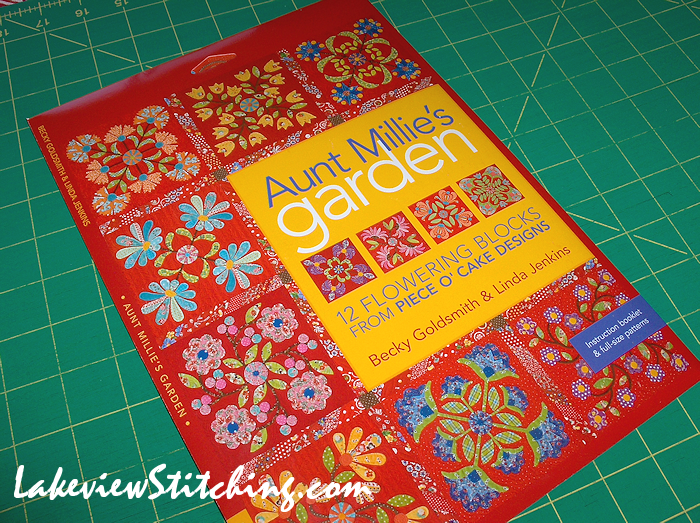 Your friend Marcie would be thrilled to know that you are finishing this one up for her and I totally love your interpretation of the blog. Just wonderful! That is WONDERFUL fabric! It does look like it is suede or velvet. I wouldn't have thought of using such a scrappy background which looks terrific! Thanks, Terry! Yes, I wish I knew the brand, because it is thicker than most batiks, but still saturated right through. I am praying that the dye is properly fixed, because I couldn't wash it without removing the pencil! Piece o' Cake designs are just lovely. I used to live near their hometown and we all loved their work although I've never made one. Like you, love red and this one is delicious. I like the way you adapted the designs. Using orange thread is marvelous. Question: I recently stitched an applique like you but my line of stitching wandered all over the place, even though the feed dogs were up. Do you have any advice on how you get the stitching parallel to to edge? So envious and need some help. 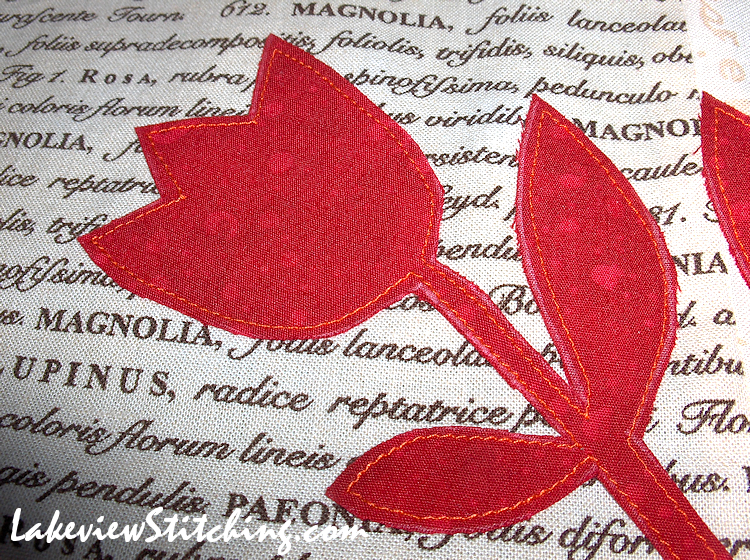 I, too, will never be doing much hand applique anymore. It was clearly meant to be! I'm a relatively recent convert to red but love this idea, and all the little changes you are making. I like Indigo Thread's fluffy edges too. I once made a quilt like Sharon's and it only started fraying enough ti lose the stitching after years on the back of the couch. I absolutely adore what you're doing with this, the appliqué in the rich red, the pieced cream background, your makers mark--so much to love about it. The orange stitching adds the perfect amount of whimsy. Can't wait to see this one come together! I love what you are doing with UFO! Beautiful! 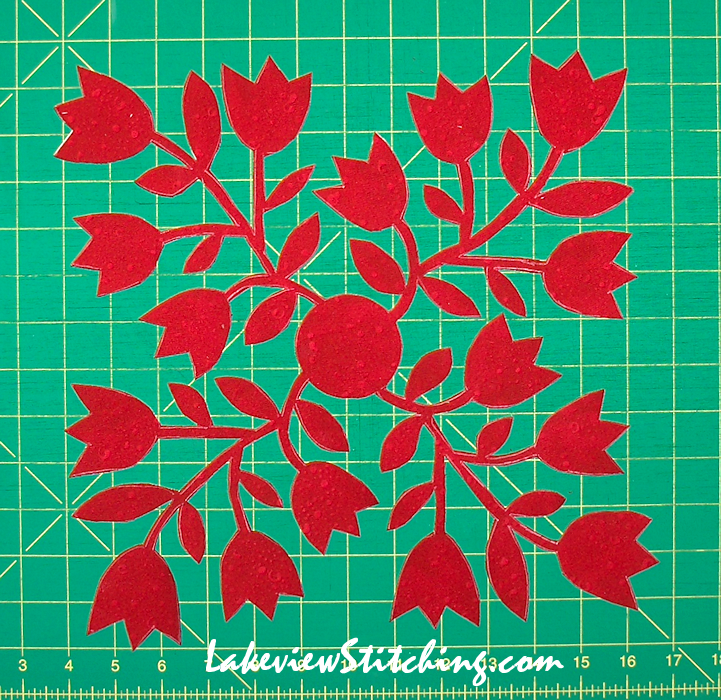 I would not have thought to do this in a solid color on a neutral background! And yes, I have this pattern, too.